People present all the time…on the telephone, through e-mail, in one-on-one meetings, in front of, or as part of a small group, to staff, customers, spouses, kids, and neighbors. 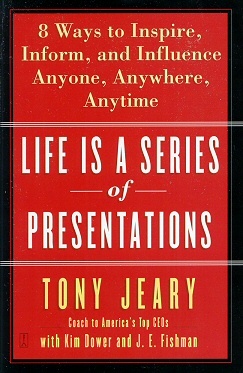 Tony Jeary, recognized in the business world as Mr. Presentation™, knows that a person’s presentation effectiveness is critical to their success, both personally and professionally. In the new book LIFE IS A SERIES OF PRESENTATIONS: Eight Ways to Inspire, Inform, and Influence Anyone, Anywhere, Anytime (Fireside Books / Simon & Schuster Trade Paperback; February 2, 2005; $13.00; 0-7432-6925-X), America’s premier presentation coach teams up with nationally-known media coach Kim Dower to teach readers that the way they present their thoughts and ideas to people has a profound effect on the shape of their own lives. At the heart of their message is the premise that each of us has more control over the impressions people form of us than we often realize. Read more about the eight essential presentation practices by clicking here! The way in which we communicate what we want – whether negotiating for a salary increase or trying to convince our spouse to take a vacation – has a profound effect on the shape of our own lives. Using specific examples, personal stories, and amusing anecdotes that speak to both professional and personal concerns, Tony Jeary and Kim Dower teach the skills only available before to CEO and celebrity clients, and show how mastering our presentation strategy will help us take full advantage of every opportunity. Tony Jeary, Mr. Presentation™, personally teaches world-class executives how to be more effective communicators. His company, Tony Jeary High Performance Resources, has worked for more than 500 organizations in over thirty-five countries. Their clients include the presidents and CEOs of Ford, Wal-Mart, New York Life, EDS, Cingular Wireless, IBM, and many other Fortune 100 companies. He lives with his family near Dallas. Kim Dower is known throughout the publishing and publicity world as Kim-from-L.A., the company she founded in 1985. In addition to her work as a literary publicist, Kim Dower specializes in training and coaching authors, celebrities, speakers and experts from all fields how to best present themselves to the media. Kim lives in Los Angeles, where life truly is a series of presentations. J.E. Fishman has worked in book publishing as an editor, agent and writer for more than fifteen years. He lives with his family in North Salem, New York.